Marc found a great little wine bar during one of his recent visits to San Antonio. Since our hotel was so close, I had to stop in for a glass. One of my colleagues that I have regularly dined with at TMEA happened to have plans for dinner, so we decided to meet for a drink afterwards at this wine bar that Marc recommended. 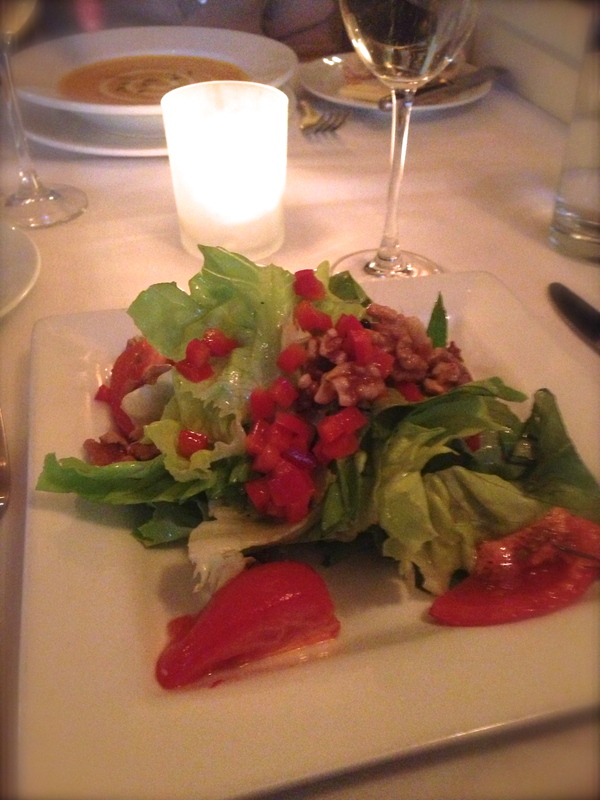 At first, we went to DRINK – right across the street from la Contessa. When I asked for the wine list and the waitress pointed to the lovely selection of mini bottles of Yellow Tail, I knew we were in the wrong place. Thank goodness the correct destination was just around the corner. The place was packed on our arrival, but after a short wait we were able to get two chairs at the bar. 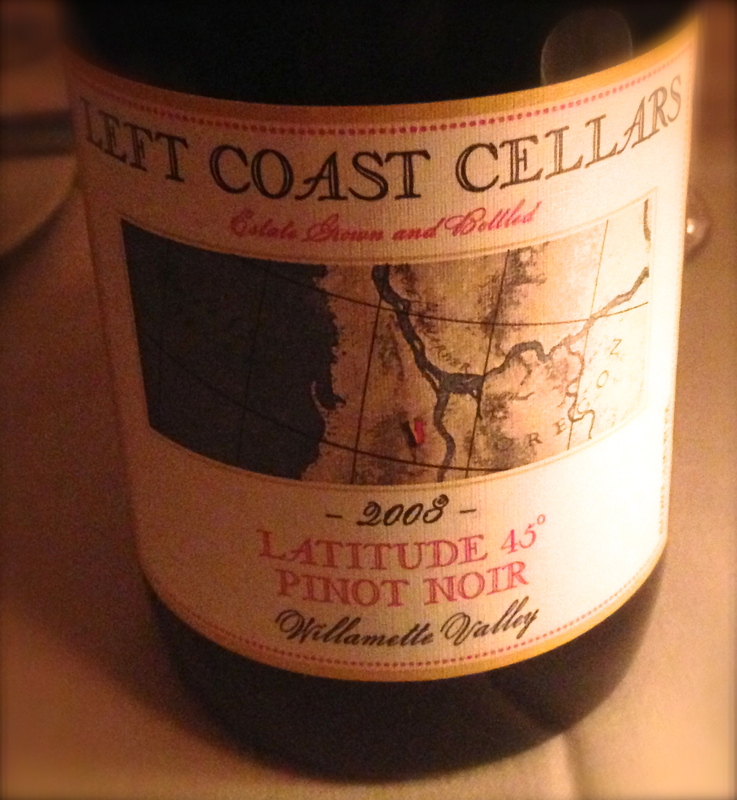 After scanning through a pretty extensive wine list, we picked out three possible reds, then asked for a recommendation. 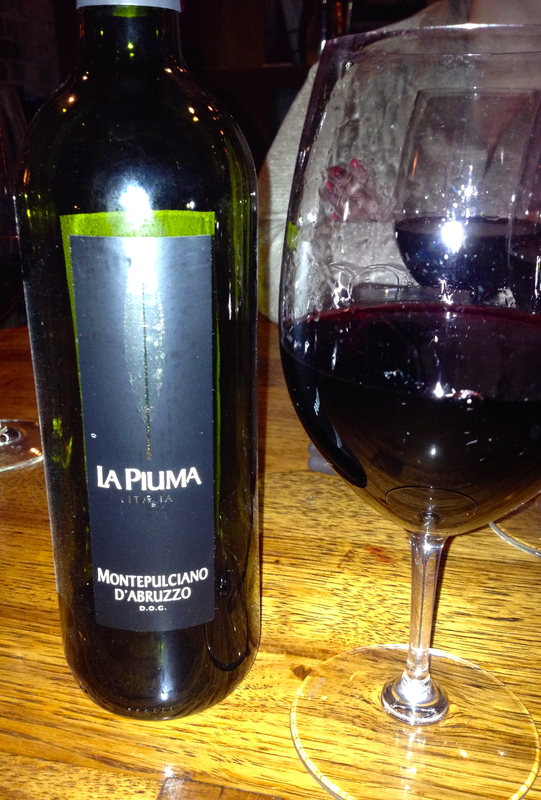 The bartender did not hesitate to select the Montepulciano. 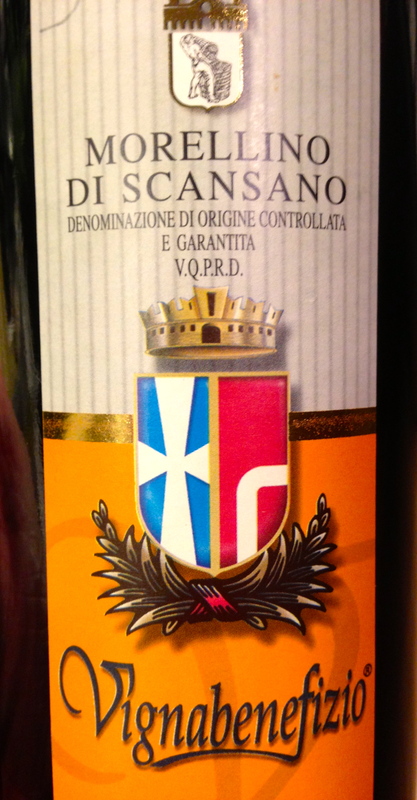 I am so lousy at describing what wines taste like, but I can tell you that I really enjoyed this Italian Red. There was a lot going on – and it was surprisingly satisfying as a stand alone drink (we were all stuffed from dinner). We later moved to a table and were joined by two more friends. It was a relaxing way to share conversation and to wind down from a very busy day of travel convention activity. Zinc is really tiny (compared to Vino Vino, our usual hang out in Austin). The atmosphere was fine except for the occasional aroma of cigars from the porch outside. 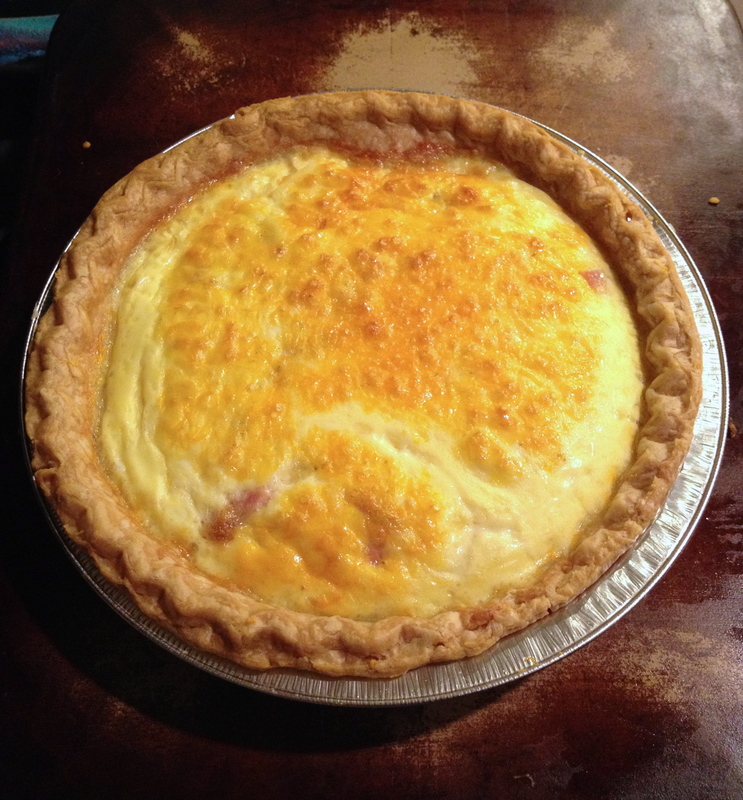 One of my oldest cookbooks, The Way to Cook by Julia Child , provides my “go to” quiche recipe. I LOVE this recipe for one simple reason. It is soooo easy to make. First, poke holes with a fork on the boom of your crust and prebake the crust for approx. 10 mins. Next, decide on the add-ins. My traditional is Bacon and Cheese – cooked and crumbled bacon sprinkled on the bottom of the pie crust, along with your favorite cheese. Then add the egg/milk mixture. All I have to remember is one egg plus milk should equal ½ cup. Regardless of the size of your crust (I use store bought, since this recipe is meant to be simple), just keep making the egg mixture and adding it to the crust until the crust is full. On top, you can add some paprika for color, and a few leaves of basil strategically placed to look pretty in the middle of the pie. It is finally here! 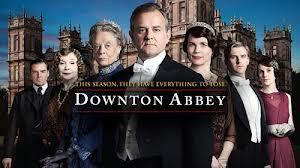 Season 3 of Downton Abbey has arrived. Although all of these cheeses were made from cow’s milk, each had its own personality and flavor. One of my favorite combos was the Cotswold, on a multi-seed cracker, sprinkled with a touch of Worcestershire. 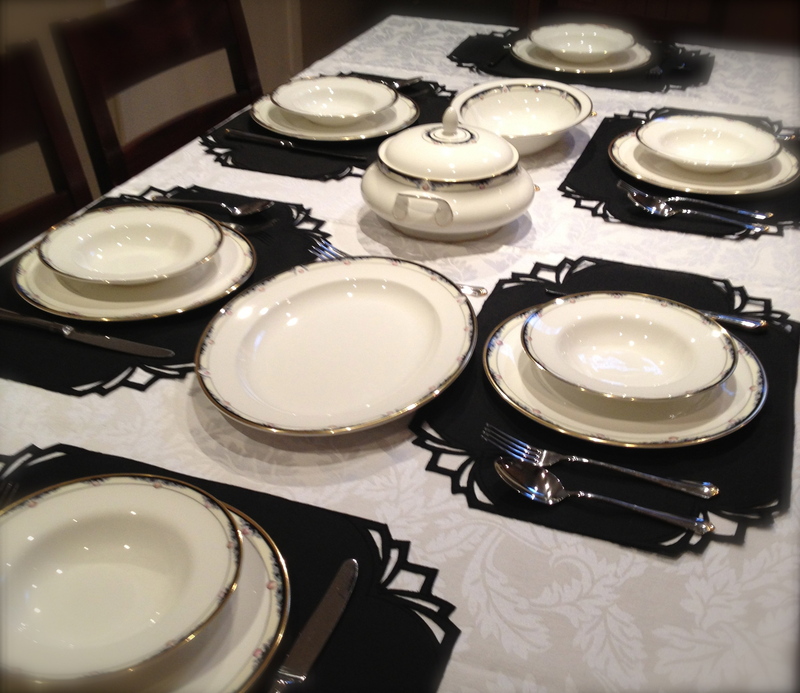 We could not resist pulling out the Royal Doulton china for a festive dinner with friends prior to the 2-hour extravaganza. 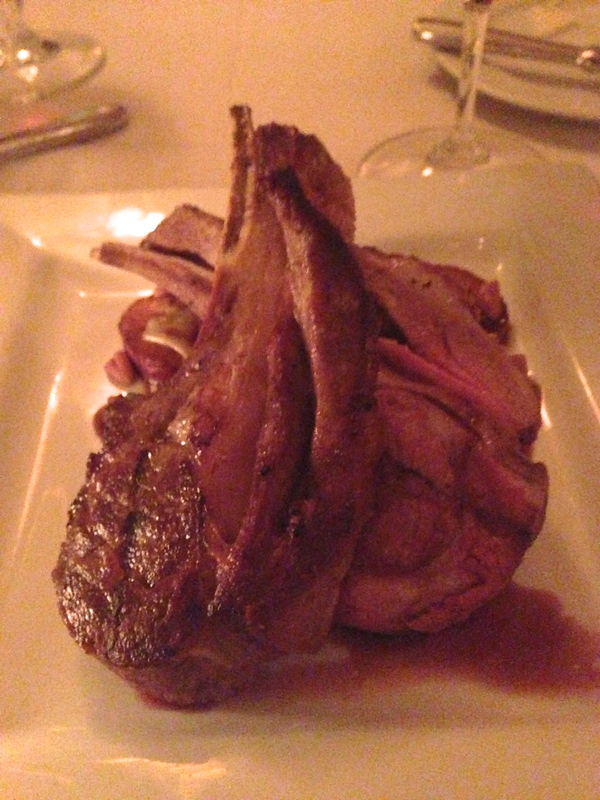 When we asked our friends which menu they would like – “upstairs” or “downstairs”, the vote was unanimous. Good British comfort food it is! 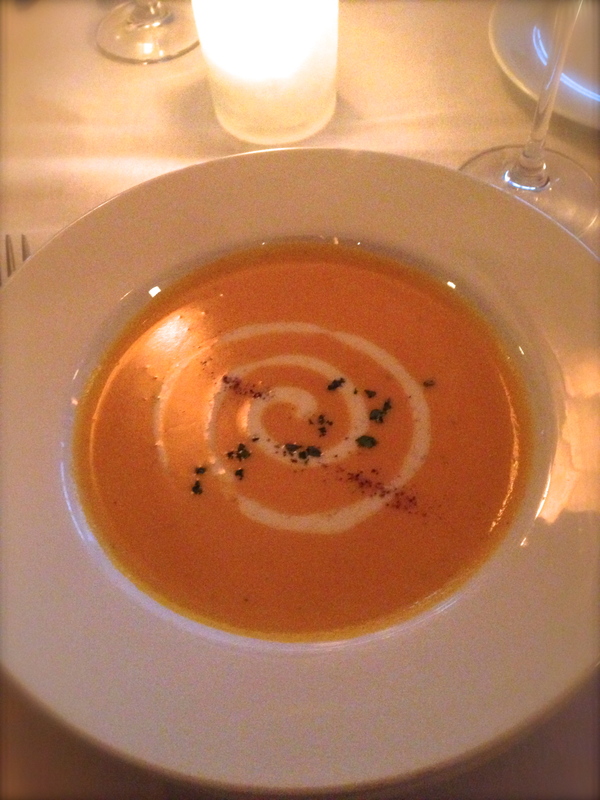 For the Soup course, a butternut squash soup. You can find my basic recipe for this dish on a previous blog. The only difference this time was the consistency. I kept it a little thicker. It was delicious, but I will probably go back to a thinner consistency next time. Main course – Bangers and Mash. Flavorful sausages made from veal and pork and hearty mashed potatoes – with lots of cream and butter. 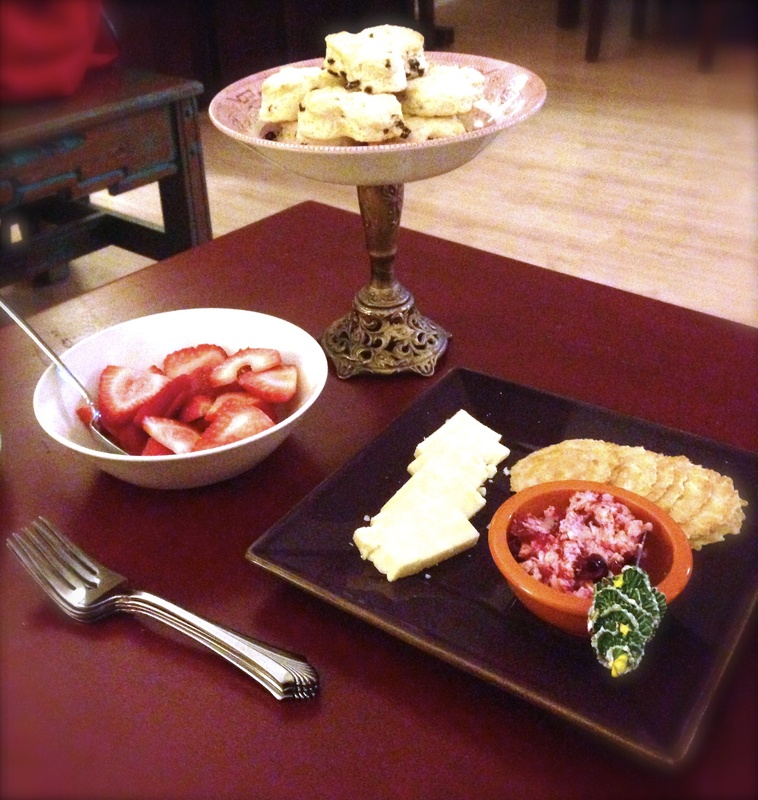 Final course – Classic Cream Scones and Strawberries. If there is one recipe that I am very partial to, it is my Classic Cream Scone. Although I have enjoyed scones from reputable creators in Austin, I can honestly say that I have yet to find a perfect scone on the market. To begin, traditional scones have currants – not raisins. You don’t want them too large – they should present a touch of class on a plate. Classic scones are also very distinctive in texture, more dense than an American biscuit. Preheat oven to 425F. Lightly butter a baking sheet. (I use a Pampered Chef stone for most of my baking, so no butter is required). In a large bowl, stir together flour, sugar, baking powder, and salt. Cut the butter into ½-inch cubes and distribute over the flour mixture. Cut in the butter until the mixture resembles course crumbs. In another small bowl, stir together cream, egg and vanilla. Add the cream mixture to the flour mixture and stir until combined. Stir in the currants. With lightly floured hands, pat the dough into a ½-inch thickness on a lightly floured cutting board. 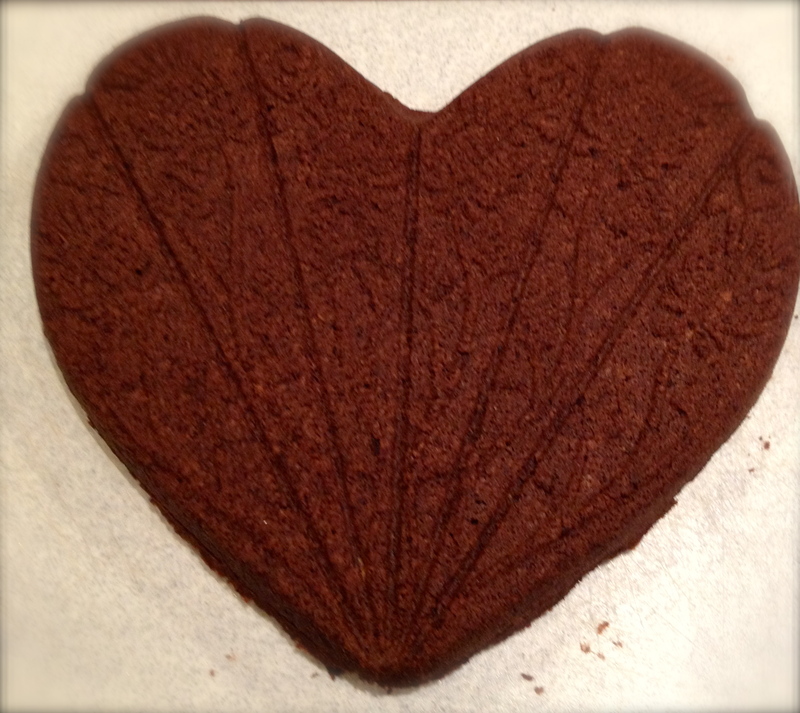 Using a floured biscuit cutter (or glass), cut out rounds from the dough and place them on the prepared baking sheet. Gather scraps together and repeat until dough is used. If desired, brush the tops of the scones with the egg mixture. Bake for 13-15 minutes, until lightly browned. Let scones cool for 5 minutes before removing them from the baking sheet to a wire rack. serve warm or cool completely and store in an airtight container. 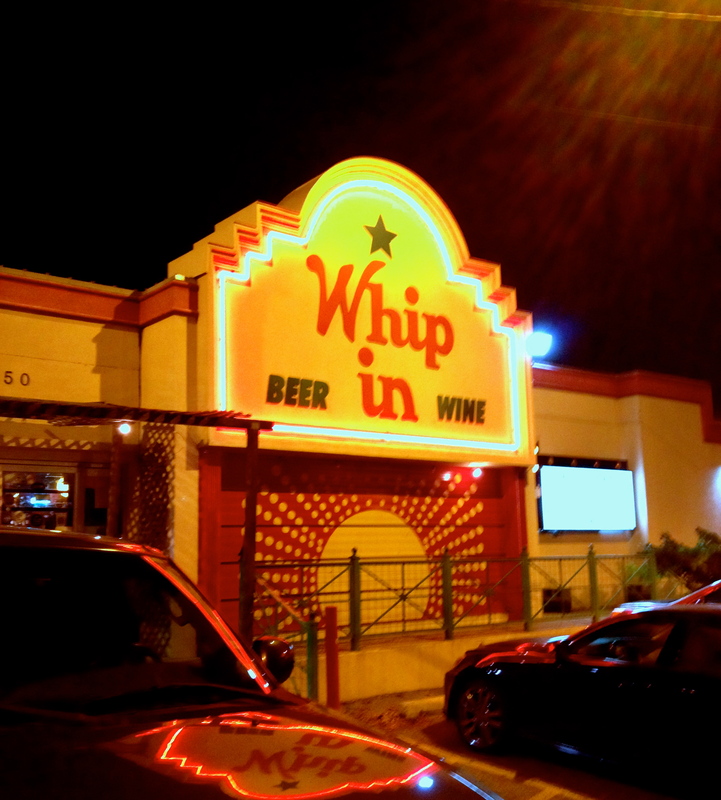 Whip In – Whip In Good!!! The Whip In. A highly eclectic establishment located on I35 just south of Riverside Drive. 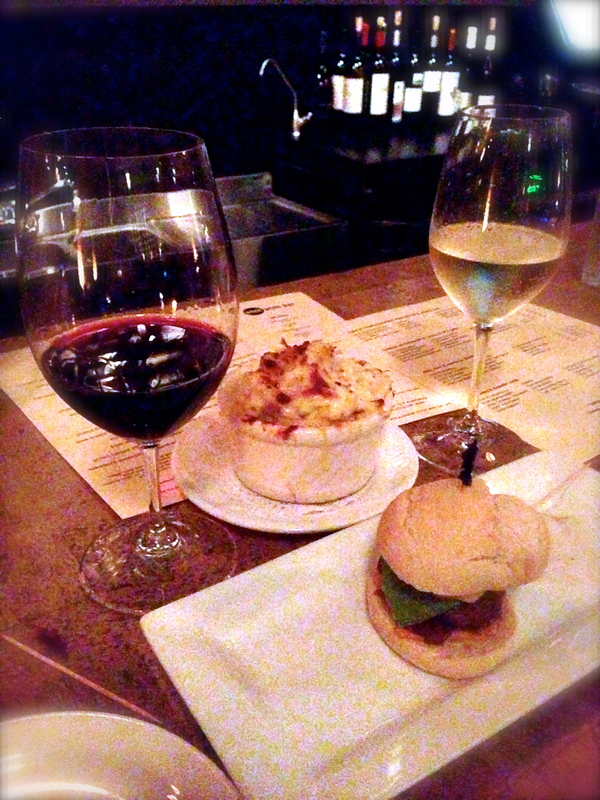 We shall share here musings on the food, wine and entertainment that we enjoyed on our first visit to the Whip In. Debra: My dear friend Gavin has been trying to get me to come hear his band play for a LONG time. Getting down to South Austin on a school night just is not in the cards for me at this time, so I was lucky enough to fit this visit in at the end of my Winter Break. 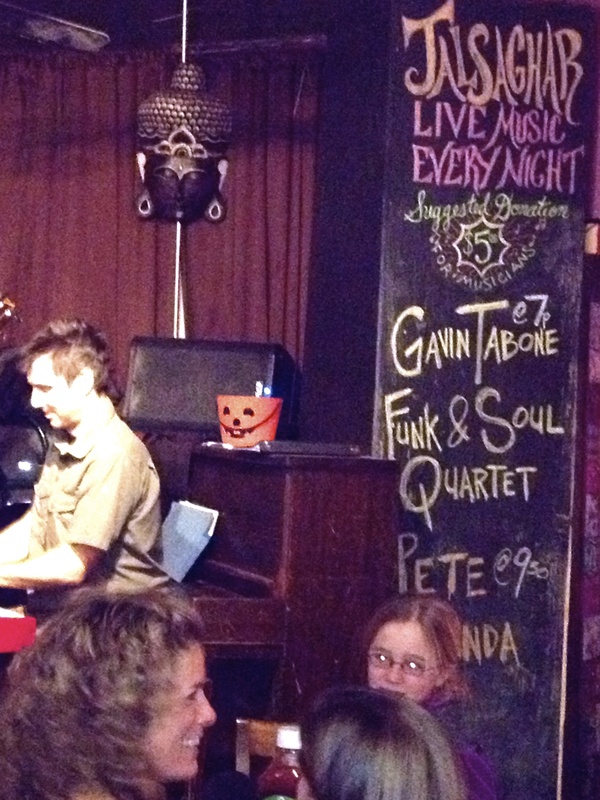 My son and I arrived just before 7:00pm to catch the beginning of the Gavin Tabone Quartet’s first set. Thank goodness they are playing indoors tonight (we have had quite a string of cold weather here in Austin). 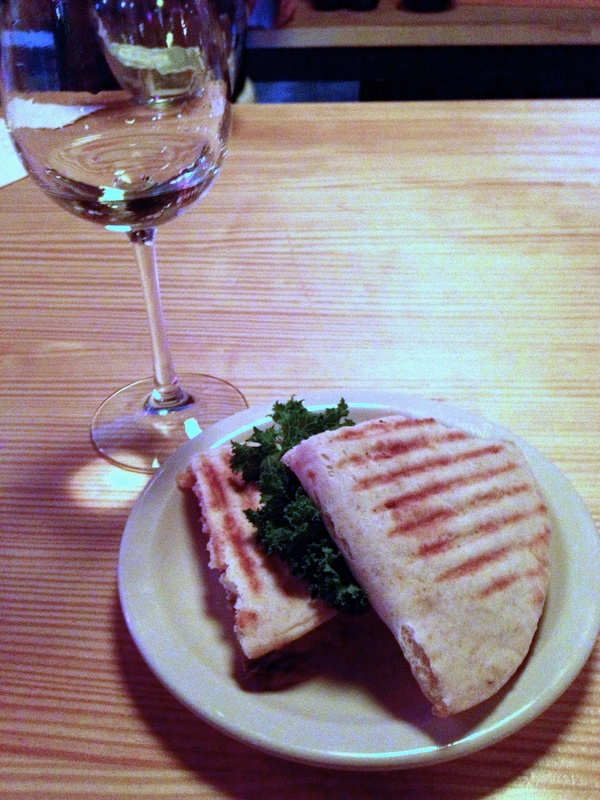 Two seats were open at the wine bar – lucky me! 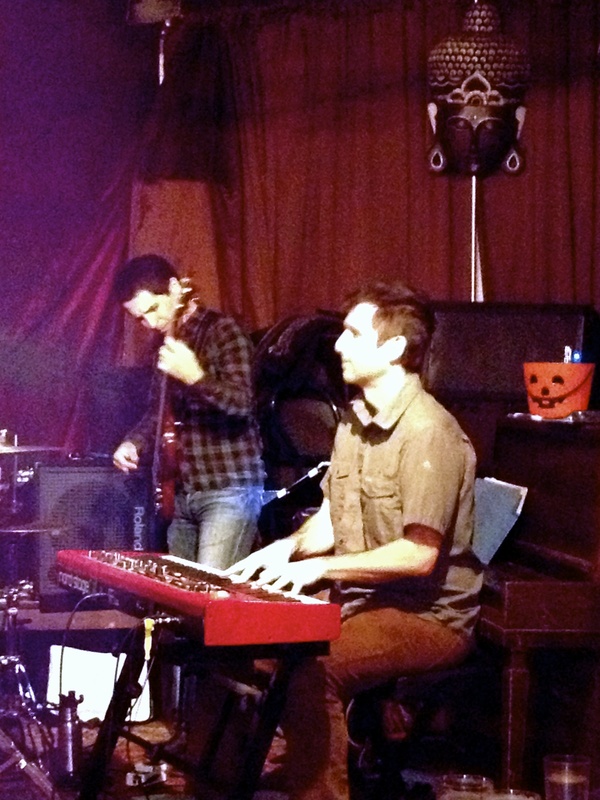 We will not go into an extended review of the music – but we thoroughly enjoyed the “funk” in the room. The quartet played a variety of charts from folks like the Meters, Al Green, Steely Dan, Earth Wind and Fire, Herbie Hancock and Sade. Way to go Gavin! The wine list provides lots of variety and some unique selections for those of us that are looking to try something new. All of the wines on the menu are offered by the half (3 oz) and full glass, as well as by the bottle. They also have a pretty nice selection of additional wines for purchase in the market, including LOTS of whites already chilled and ready to drink. 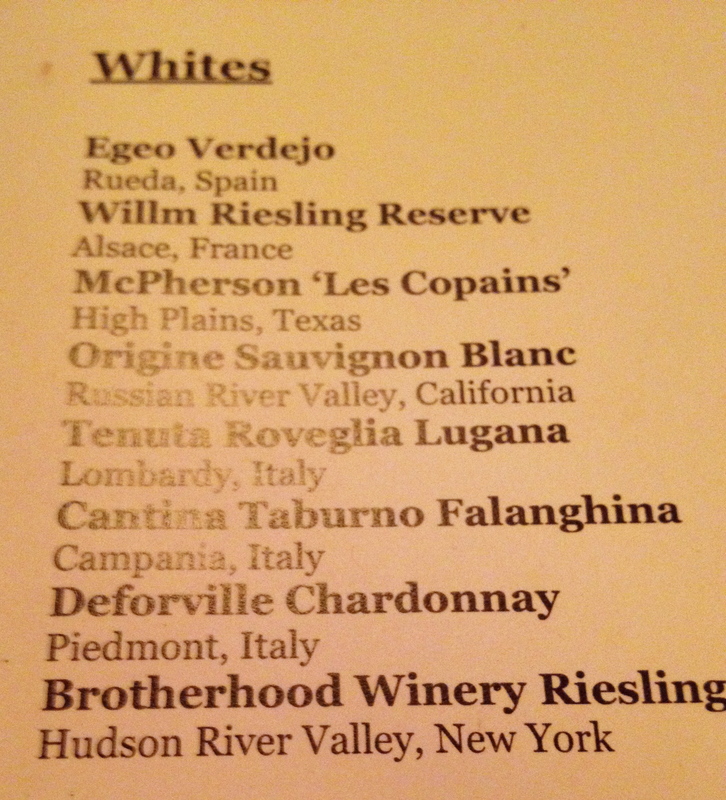 The first wine to catch my eye was a Deforville Chardonnay from Piedmont. I had no idea they were producing Chardonnay in this region of Italy, so I enquired, tasted, and settled on my inaugural pour of the evening. A delicious wine – buttery, smooth, crisp – and no oak. Reminded somewhat of a good suave. I knew I would delight in the mango chutney, but the lovely surprise in this sandwich was the creamy, warm feta alongside the chutney and pork. Although I was ready as always to dive into a red to accompany my pork, the wine steward suggested another Italian White – the Cantine Taburno Falanghina from Campania. A simple, refreshing drink – an admirable pairing with the Woodlands sandwich. At this point I am really excited that they offer half glasses, because now I can move on to a red. Once again the lovely young girl at the wine bar made a recommendation – this time a selection that was not listed on the current wine list. 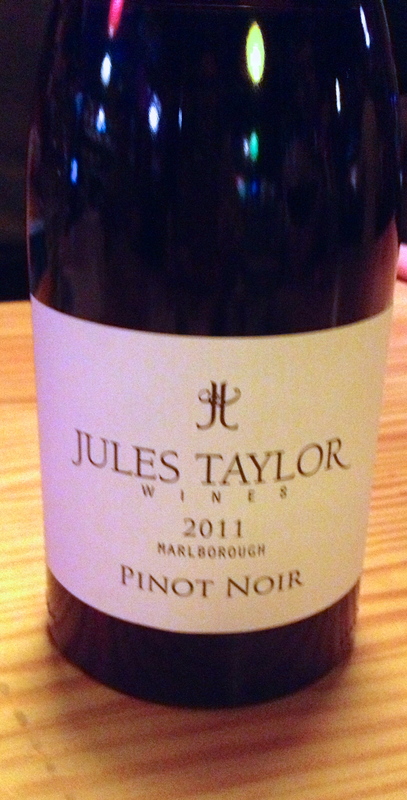 Beautiful ruby color, round, smooth – perhaps some cherry notes. I am so NOT the best at describing wines, but I can usually tell when a wine is good – and this one made an impression on me. 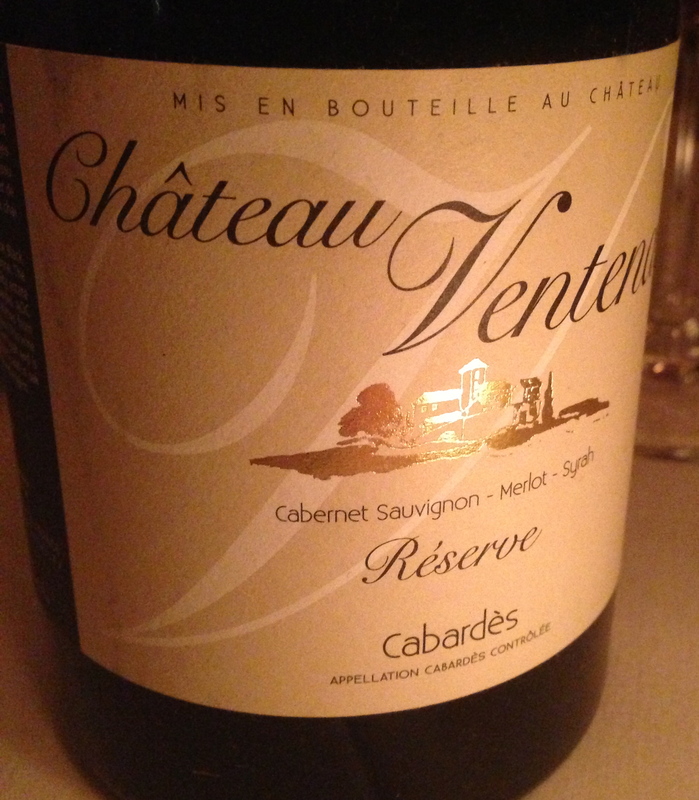 I can always tell if I like a wine – and I LOVED this one! At a little over $30 a bottle, it would be out of our regular price range, but I would definitely consider purchasing this for a special occasion. Tasting Notes from the vineyard – an interesting read for those of us wanting to learn more about the process of creating wine. Marc arrived for the last song of the second set (after his opera rehearsal). While he enjoyed a couple of beers, I finished off the evening with a chocolate cupcake with hints of cardamom and an orange cream frosting. I could not resist one final taste – they had a favorite Lambrusco on the BUBBLES list, so that was a no brainer. The Cleto Chiarli Lambrusco was first introduced to us at WINK. We’ve been fans ever since. One of the best parts of having an extended holiday break is getting to spend time in the kitchen. Although I did try a few new recipes, this year I prepared a lot of the boys’ favorites. 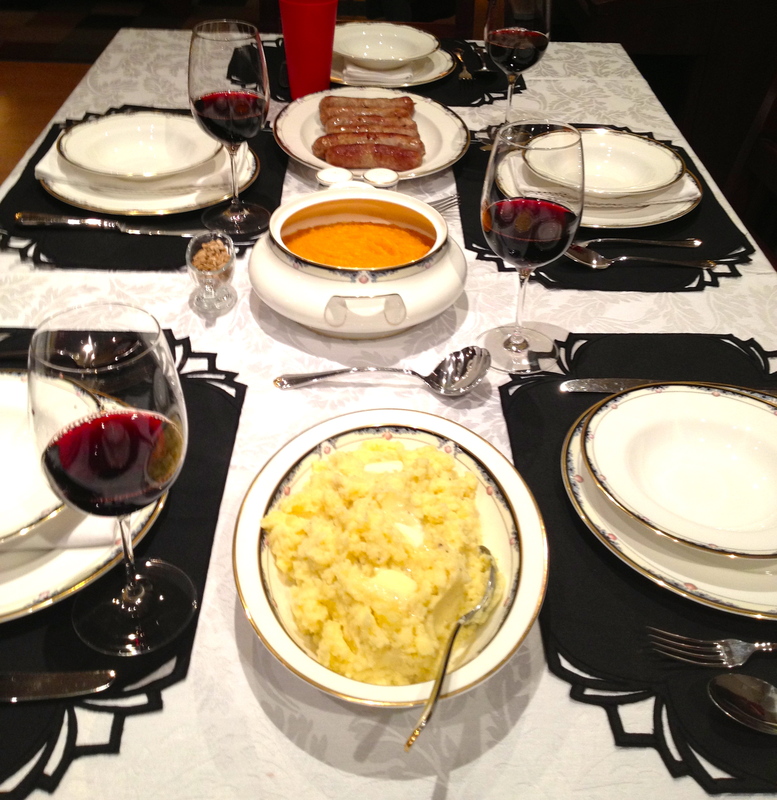 The colder weather provided the opportunity for us to enjoy some recipes we have not made in a long time! 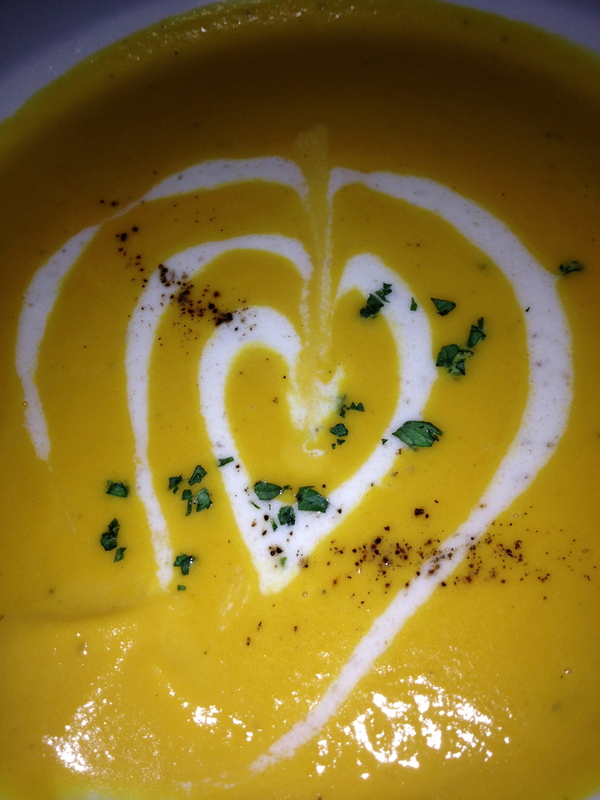 We absolutely love this soup. Reheats well. I found this recipe on the Whole Foods App on my iPhone a couple of years ago. I actually use this App from time to time when I am at HEB and need a new idea for a dish. This is a perfect side for the spiral ham that we frequently pick up after Christmas (on sale most years at this time). 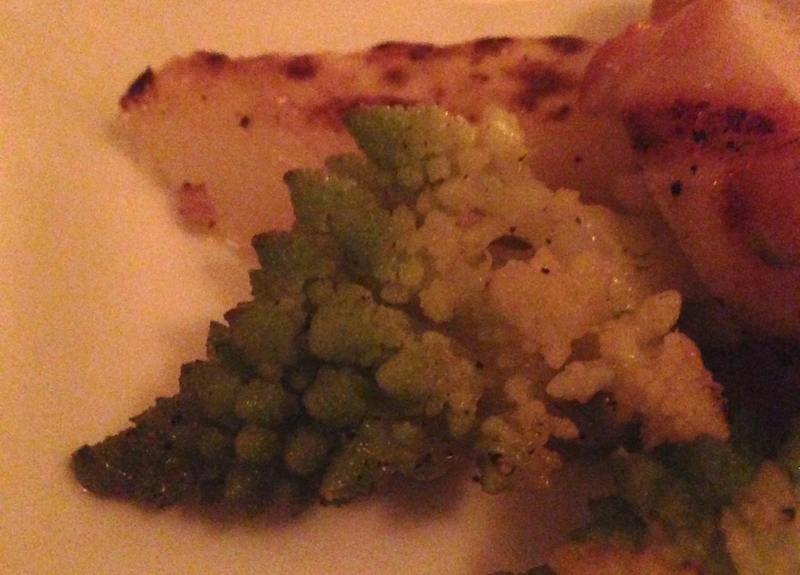 Once again, we opt out of a few veggies – no peppers or onions (I just sub a little onion powder). Not enough anyways to make a difference in the “healthy” quotient. I don’t always go for the “light” recipe – sometimes it is just easier to use 2 whole eggs and regular cream cheese. This is my first new recipe for the holiday break. Very simple and quick. 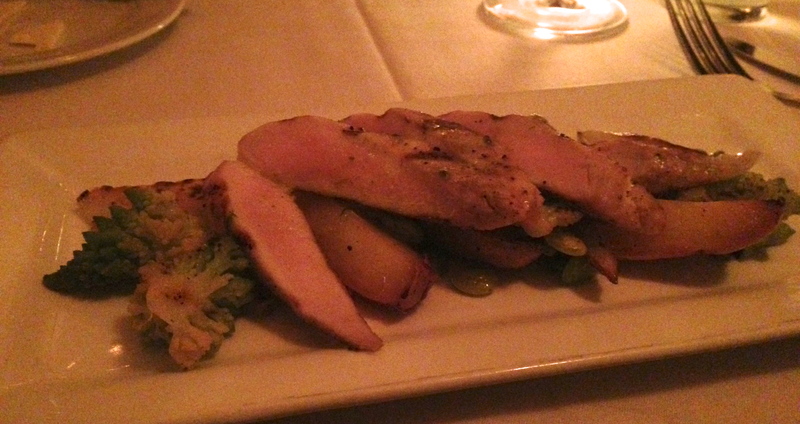 I sliced the boneless chicken breasts in half lengthwise – they are so large otherwise. The oregano is still thriving in my garden, so I placed a sprig on each piece of chicken before wrapping it with the prosciutto. Since my homegrown oregano has pretty thick stalks, I pulled the sprigs out before serving. The leftover chicken provided a nice addition sliced on top of a spinach salad the next day. 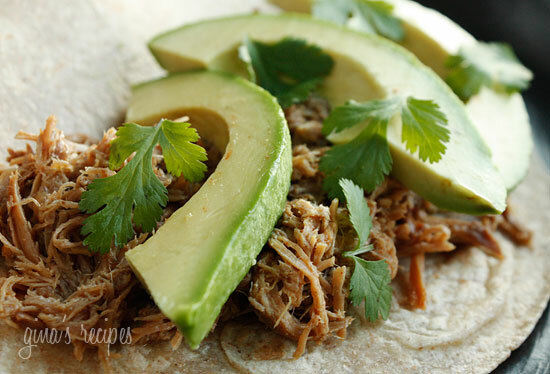 This recipe is a little more labor intensive then most of Rachel’s recipes, but well worth it. I found this one online when I was scoping out her SXSW party here in Austin a couple of years ago. 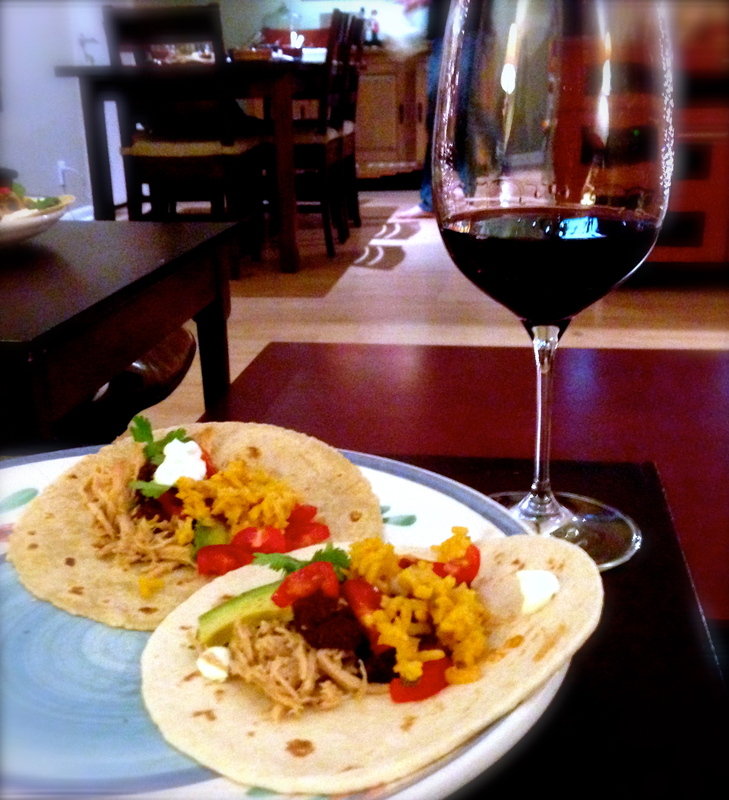 *Salsa note – this is where I got my inspiration for our family go-to salsa recipe. I basically make the fire-roasted salsa as stated in the recipe. Then I toss it in the food processor to get rid of the big chunks of veggies. Adding a little Chipotle Tabasco and fresh lime juice after processing provides the final layers of flavor. 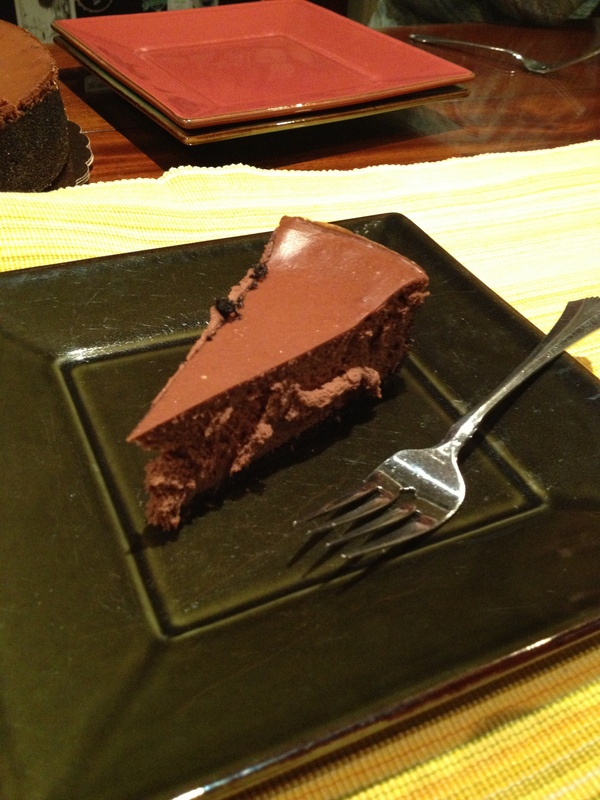 In searching for a quick dessert to accompany our New Year’s Eve Mole feast, I came across this recipe – tons of rave reviews intrigued me to give it a try. I was pleasantly surprised at how easy it cut when it was cooled. The only change I made to the recipe was waiting to drizzle the honey until right before I served it. In fact, you could put the honey on the table and let everyone choose the perfect amount of honey for their liking. 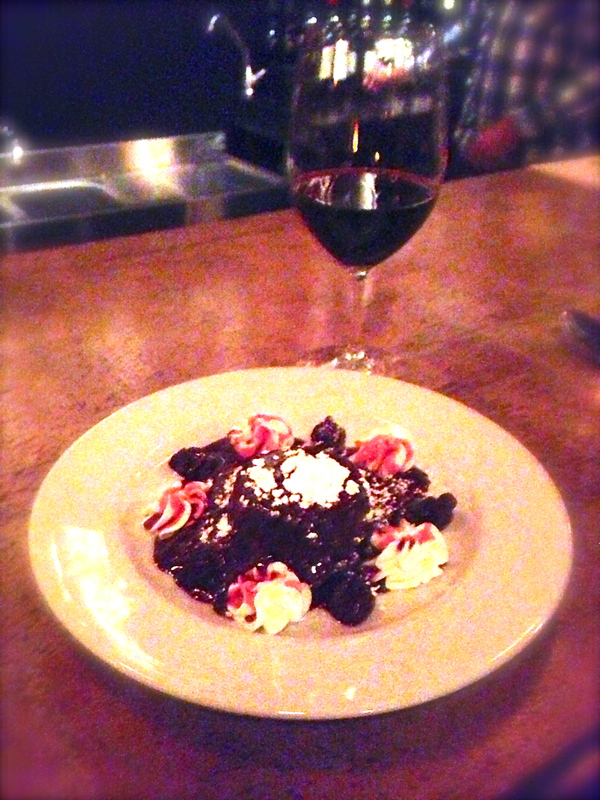 The verdict was – YUM! A video of the easy prep for this recipe is provided at the link above. 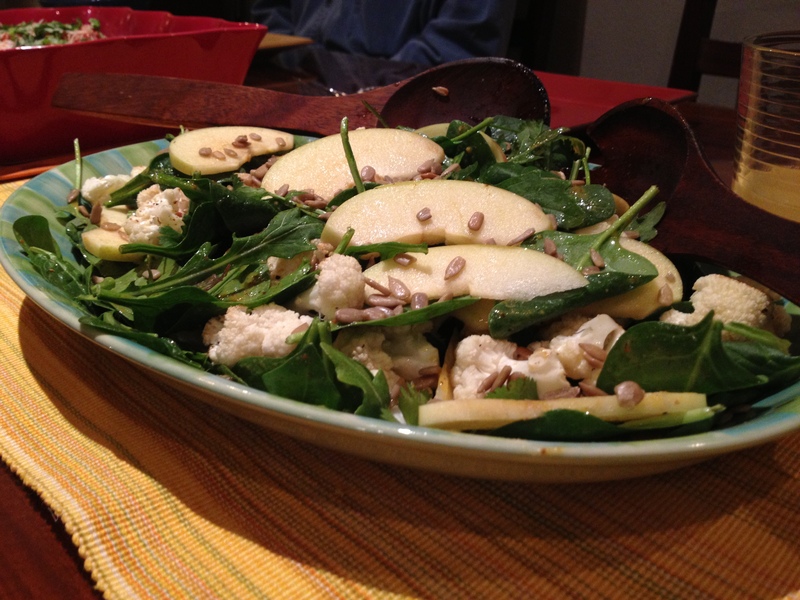 Would love to hear about some of the recipes you have been enjoying this holiday season! 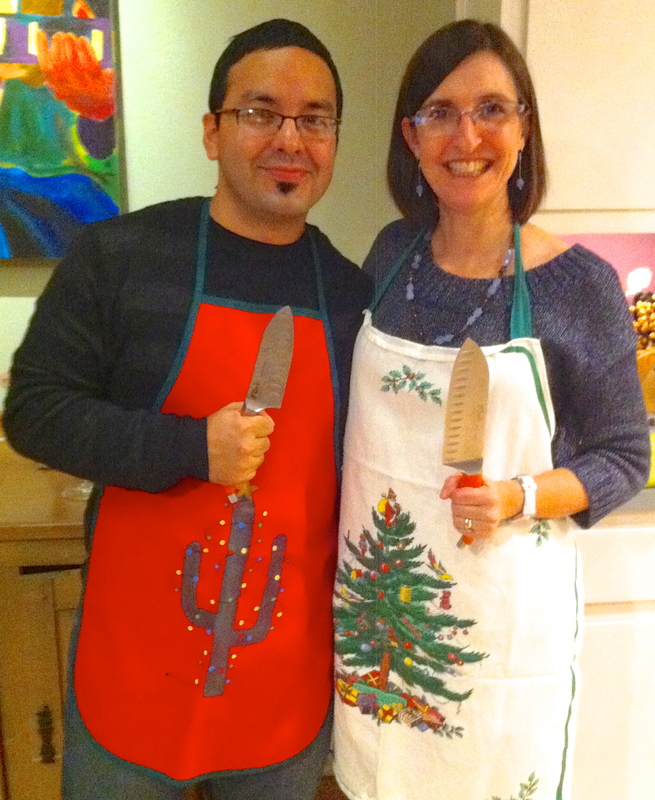 We have participated in some delightful holiday gatherings over the past couple of weeks. 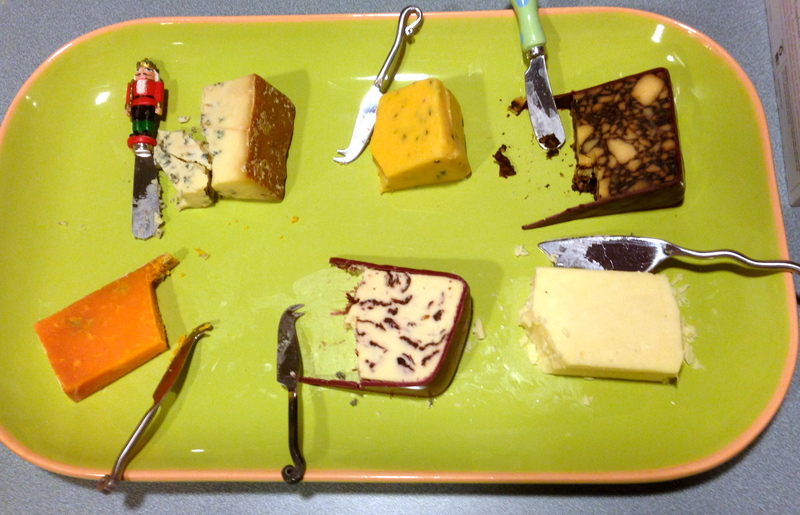 In an earlier blog entry, we shared details about our wine/beer/cheese pairing event. Here are a couple of glimpses of other opportunities that we have enjoyed with friends. 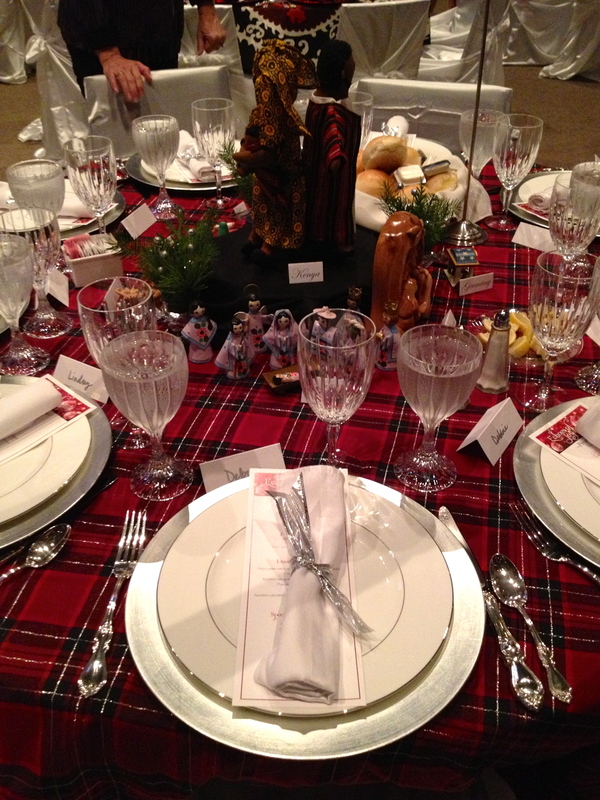 This was our table – several nativity scenes from around the world were displayed. 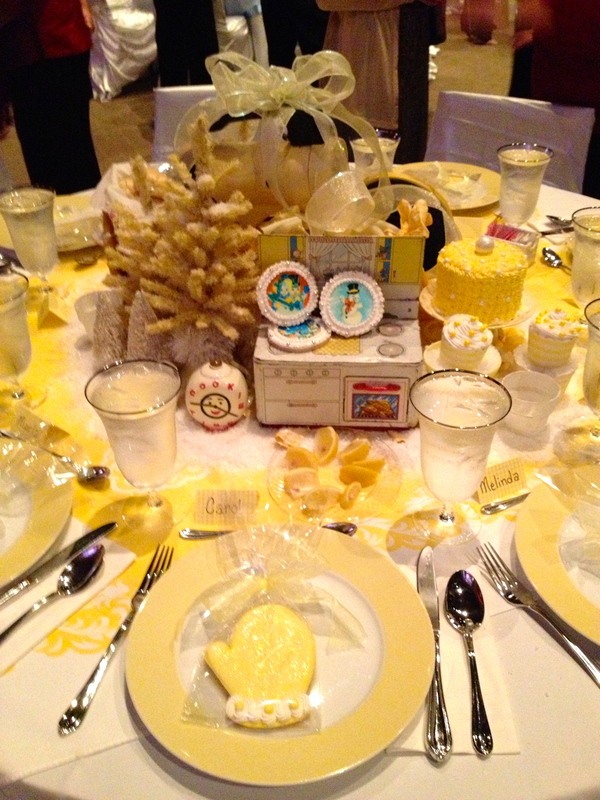 I loved this table – a baker’s delight! Along with a spirit filled program of music and words, we enjoyed a fabulous dinner. A juicy, fruited chicken breast filled with flavorful stuffing, accompanied by roasted vegetables and a light and refreshing salad. BHWC PROGRESSIVE DINNER–Three of my neighbors and myself hosted this year’s Balcones Hills Women’s Club December party. 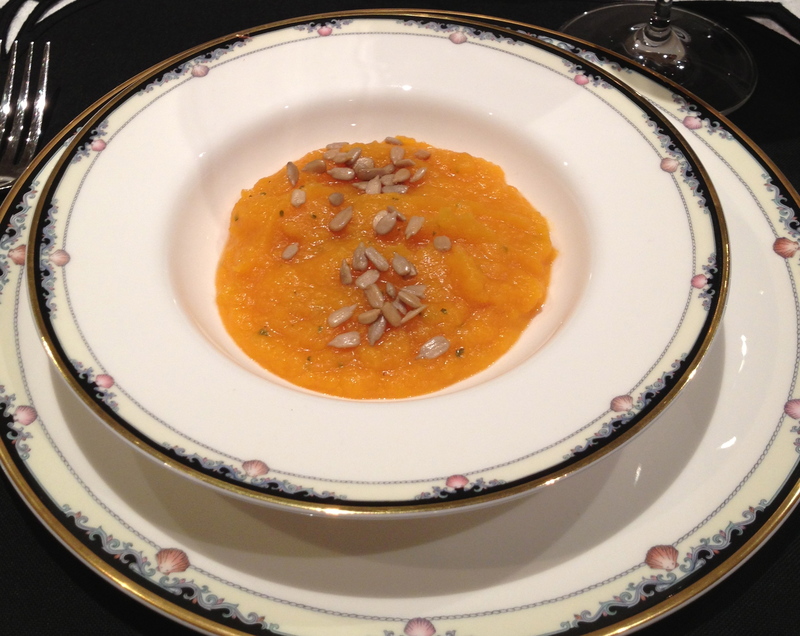 The evening began at our home with the appetizer course. 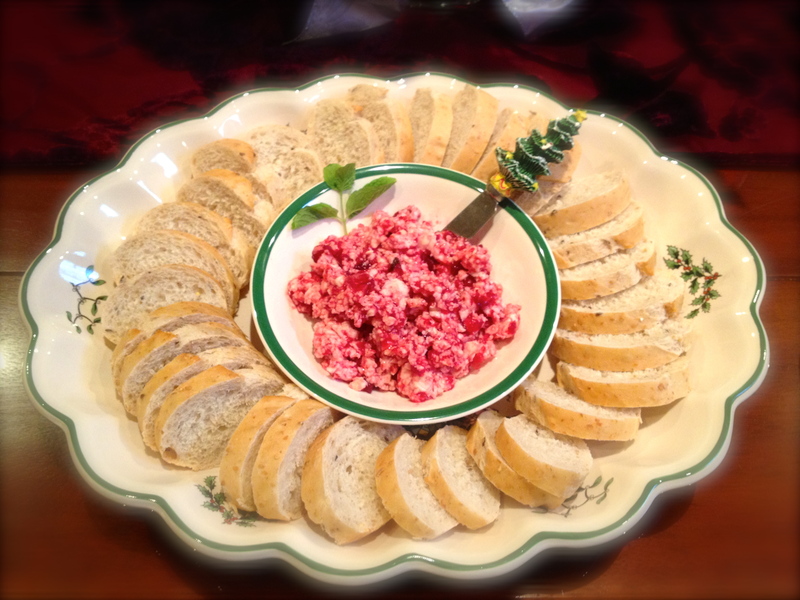 We served a fun assortment of cheeses from Antonelli’s and my cranberry chutney butter spread with a multigrain baguette from Central Market. 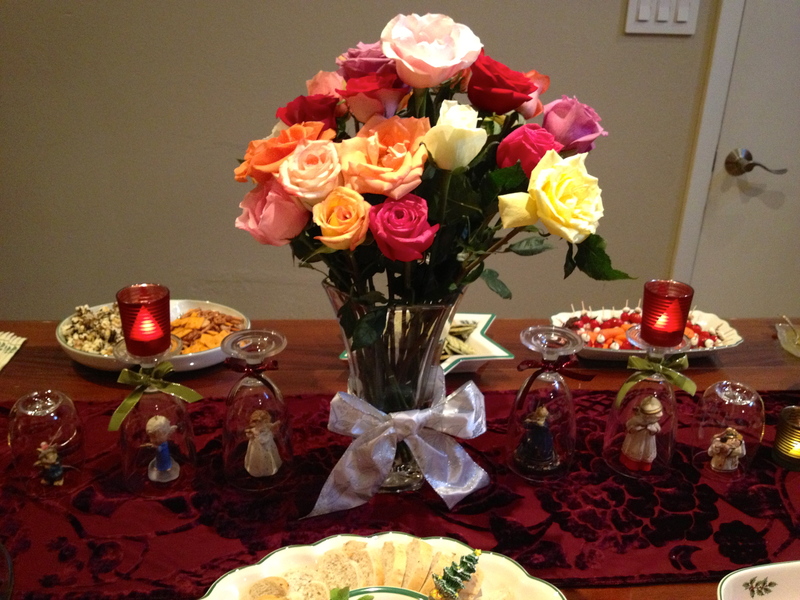 I also have to show off the beautiful roses from my 25th Hill Anniversary celebration. 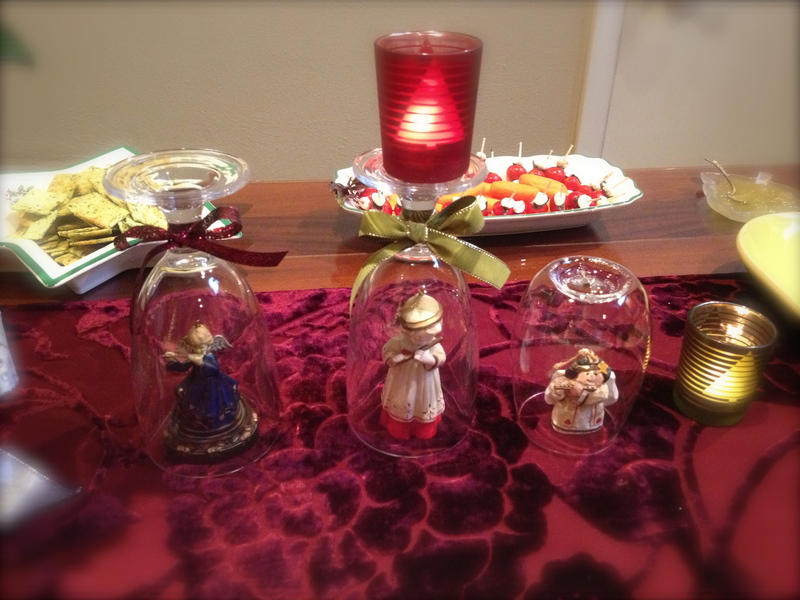 They added so much to my simple table decorations. …and a close up look at this cleaver idea I saw on Martha Stewart’s website – she put live flowers in her wine glasses. I decided to showcase my collection of flute ornaments. 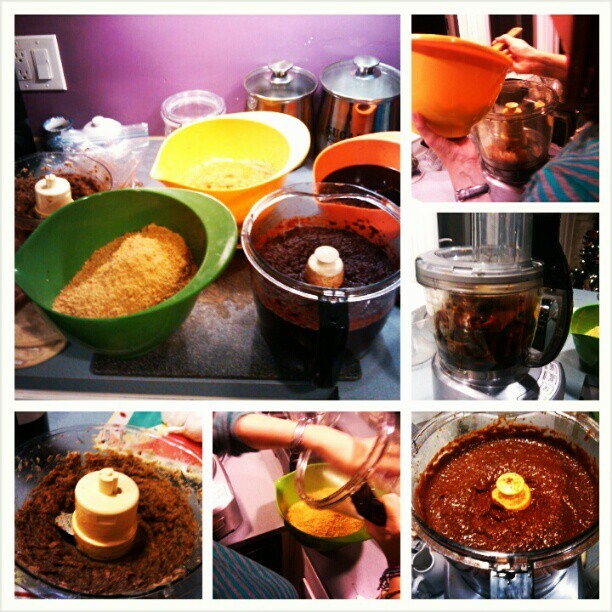 MOLE MAKING PARTY–Our 3rd annual mole making party was a hit again. We have learned that you can purchase all of the necessary ingredients in one trip if you head over to Fiesta Market, east of I-35. Several friends came over to lend a hand with all of the prep work – mostly chopping and frying. Now that I have made it three times with the help of a dear friend, I think I could go solo if I had to next time around. We finished in record time! I can not wait to dive into to finished product on New Year’s Eve. It is currently resting and developing flavor in my fridge. 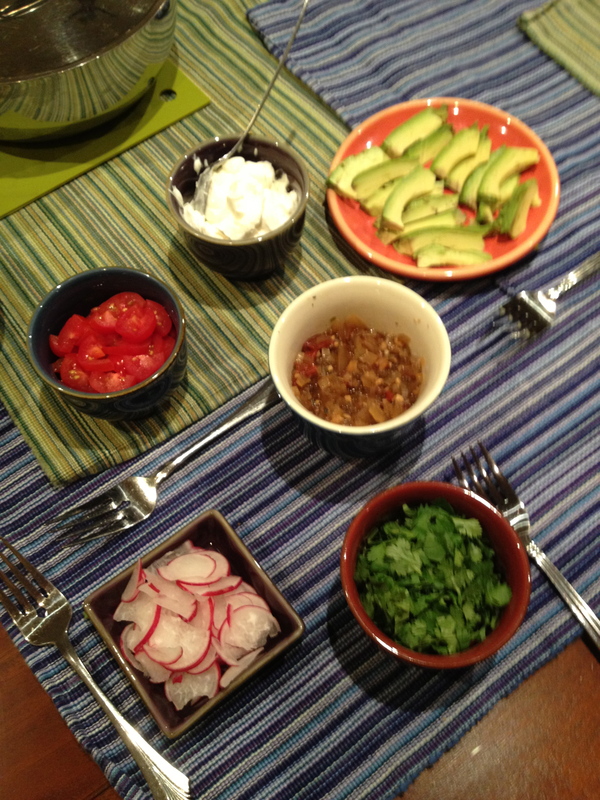 PS – for dinner we enjoyed baked potatoes with fixin’s – including a great cowboy chili (thanks Mike). Dessert was a chocolate shortbread with ice cream and gelato. CHRISTMAS DAY 2012– Christmas Day found us with the Carmack Clan (Debra’s family). Papa cooked up another amazing turkey with the BEST stuffing ever! Only to be outdone by his AWESOME gravy! Impossible to recreate (with pictures or words) the smells, textures and flavors of these three critical components of the holiday dinner. Papa is the master – every year it is perfection. Thanks Dad. Love you!! … oh yes, the Pumpkin Pie was pretty darn delicious too. Perfect with a small dollop of whipped cream. I am bias, however. It is my all-time favorite dessert, when it is made by way of my Mom’s recipe. Nothing fancy. Just the recipe on the back of the Libby’s can (with a little extra spices) and fat free Cool Whip. Heaven on a plate. NEW YEAR’S EVE 2012- (I know… No pictures) It is hard to believe that 2013 is here! We brought in the New Year with our 3rd Annual Mole Eating Bash. As always, the food is wonderful, but my favorite part of the evening is spending it with friends. Thanks to everyone who joined us for the festivities. 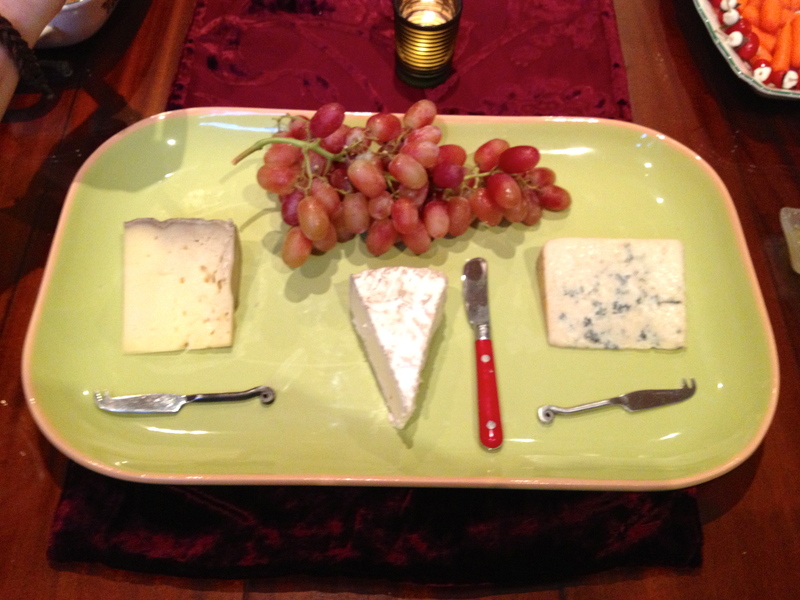 * Cheese Platter – three lovely cheeses provided by one of our dinner guests. She purchased all of the cheeses at HEB (Her HEB has a cheesemonger!). * Mexican Rice – made in our reliable rice cooker. Add 2 cups rice, 3 ½ cups of chicken broth and ½ cup of a tomato/garlic/onion puree to the rice cooker. Start. Done. * Pinto Beans – made in the slow cooker. Soak the dried pintos overnight in the crockpot. Add a ham hock or two (I had a spiral-sliced ham, so after I removed as much of the ham as I could, I just put the bone in the crockpot with the beans), add water to cover and cook all day on LOW. 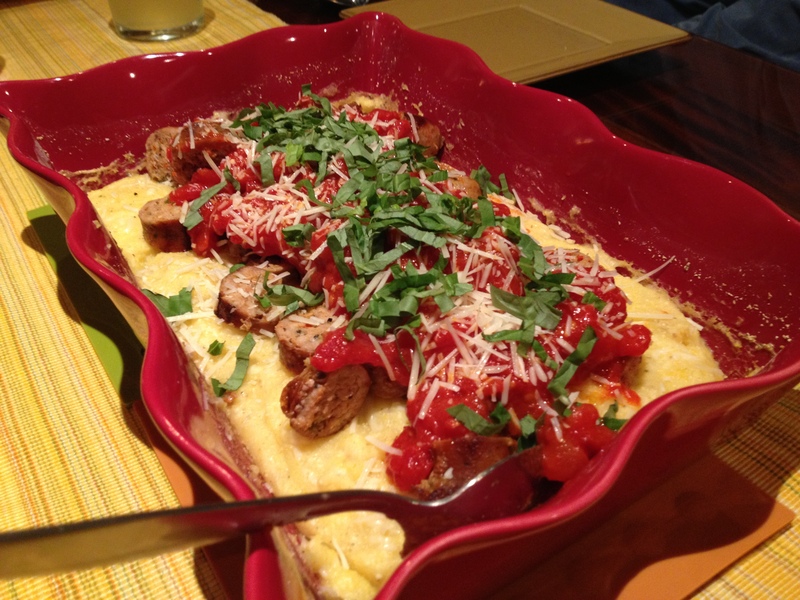 * Butternut Squash tamales with Borracho Sauce – brought by one of our guests. These were amazing! If I can get my hands on the recipe I will share. Hope all of you have enjoyed some culinary treats this holiday season!